UPDATE: there are more fixes in 9.3.2. You can’t get 9.3.1 anymore unless you’re on an iPad Pro 9.7 inch. The easiest way to update your device to 9.3.1 is “through the air,” which means you get the update via WiFi rather than over a USB cable connected to your Mac (or pc). When you update through the air it’s quicker and simpler than the connect-to-the-computer-with-a-USB-cable method, and most of the time it’s just as good. I recommend you do your iOS updates “through the air” every time. Be sure you’re connected to WiFi. Apple won’t let you download the updater if you’re using up your cellular data. Be sure you have a recent backup. Check for a backup of your iOS device on iCloud by tapping the Settings app, then iCloud, then Backup. 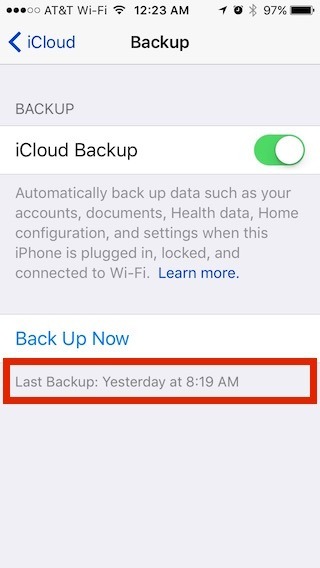 If iCloud backup is turned on you’ll see “Last Backup:” and a date on the lower part of the screen. The date should be today or yesterday. If it isn’t, tap Back Up Now. Be sure your device is charging. You don’t want to run out of battery power during a software update (it could make your device unusable). Be sure you know your Apple ID password. You’re going to be asked for it when your device restarts at the end of this process. (If you’re not backing up to iCloud you can back up to your computer using a USB cable. I recommend you turn on the iCloud backup because the backups are automatic. Read my article about backing up to iCloud for more information. )Updating through the air is easy. Go to Settings, then General, then Software Update. Follow the prompts, be prepared for the process to take half an hour or so, then go for it (assuming you should– see below). If your iPhone or iPad is on iOS 8, go ahead with the iOS 9.3 update. If it’s on iOS 7, you might want to stay there. If it’s on iOS 6 definitely stay there. Generally speaking, it’s OK to update your iPhone or iPad two versions past the system it came with. Beyond that, your device will probably not have the horsepower to run a higher system. So, if your iPhone came with iOS 8, you can feel confident in upgrading to iOS 9 and later to iOS 10. But if your iPhone came with iOS 6, you should stop at iOS 8. The ones that came with iOS 7 are the tricky ones– but to me, if you’re happy with iOS 7, I’d stay there. Yes, there are new features in iOS 9, and a few more new features in iOS 9.3, but I don’t think it’s worth the trouble. And there is always a risk that you’re going to break something. There are always special cases so your iPhone might be the one that should be upgraded to iOS 9.3. You can email me and we can figure out what’s right for you.